Education Costs > How Much Does School Lunch Cost? No matter which school your child attends, a school lunch is going to be available for purchase. and the cost of a school lunch is going to vary depending on the school’s location, the type of school (elementary, middle, high), the items being purchased and the parent’s income level. On average, a lunch at school can cost anywhere from $2.50 to $3.50. These lunches will generally include two to three different choices. On top of the main meal, additional sides, such as fruit and vegetables, can be added. Most of the time, middle and high schools will be about 20 to 30 percent more than the elementary school prices. For example, the Chaparral Elementary in Calabasas, California charges $3.50 per day for lunch, while the Fairfax County Public Schools in Virginia charge $2.65 for lunch and $1.50 for breakfast. The government has a National School Lunch Program that is a federally assisted meal program that assists children that meet certain income levels. If a parent meets these income levels, the lunch is either free or less than the standard price. As of 2017, if your family income was between $31,590 and $44,955, a lunch will be less than $0.40. If the income is below $28,655, the lunch may be free. According to SchoolNutrition.org, the average school meal prices across the country widely vary. At an elementary school, the costs average out to about $2.34, while a middle school has a $2.54 average. A high school can cost $2.60 per lunch on average. ATTN.com created an informative infographic showing what the average student pays per state. According to this infographic, the costs were as little as $0 in West Virginia, District of Columbia, Alaska and West Virginia, while some states were close to $3; however, most states were in the $2.20 to $2.50 range. One of the most expensive schools, mostly located in Hawaii and California, crossed the $5 per lunch mark. Most schools will generally offer up to three meals a day. For example, some schools may offer a few of the same things each day such as a hamburger, fries and/or pizza. A calendar is generally handed out at the beginning of the year or at the beginning of the month. The food schedule can also be found on most official school websites as well. Some schools will allow students to carry a school debit card, and the meals will be charged to the student’s card. Upon the end of the end of the month, the bill will be sent to the parent. Total meal charges for the month can range from $25 to $90 per month, depending on what has been purchased. Breakfast and additional snacks will be extra, commonly referred to as a la carte. These can cost anywhere from $0.50 to $2 per each item, on average. For example, a carton of milk could cost about $0.50, while a cookie could be $0.35. Adult meals are going to cost around $1 to $2 more than the children’s meal. 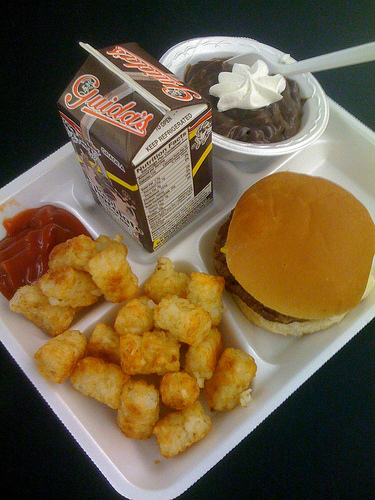 Check with the Federal government program or the school to see if your child qualifies for a lunch. If you do feel you will qualify, the school will have you fill out paperwork to determine if the household qualifies. Packing a lunch is not only going to be cheaper, but it is going to be a lot healthier. While schools are trying to become healthier, some are many years behind when it comes to providing a nutritious meal.